Envelop Desk | Herman Miller Desks | Herman Miller Furniture (India) Pvt Ltd.
Envelop is a revolutionary desk that moves to promote better posture and comfort. Itâ€™s available with standard pin-height adjustment and supports a range of seated postures. Finally, an adjustable desk that helps you, your chair, and your technology work in harmony, so you can feel better and work better. When you sit in front of a computer all day, you and your chair move, but the technology stays put. The result? A poor connection, back and neck pain, eyestrain, fatigue. The radical solution? 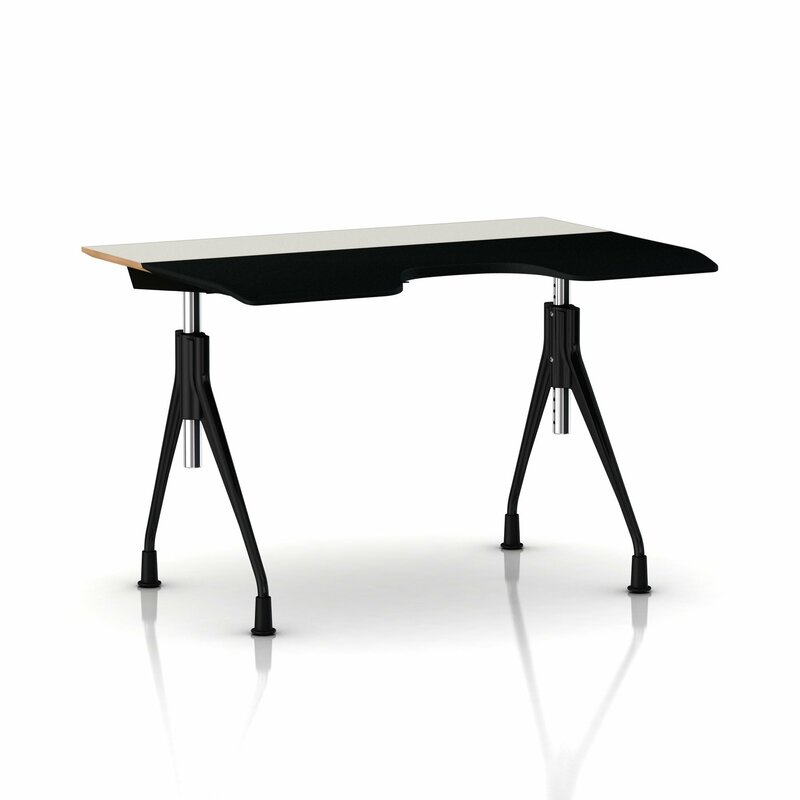 Envelop, an adjustable, ergonomic desk that helps you move throughout the day while keeping your eyes focused on the work. When you sit at your computer, your body aligns itself so that your eyes focus most easily on the monitor. Because the ability to view the monitor is most important, your eyes will always "win"â€”even if that means the rest of your body loses. Envelop's unique design features a surface that slides toward you and away from you, with a seventy-degree tilt that keeps technology in the correct ergonomic positions and maintains the visual display at the optimal distance. It's called Envelop because the "infield"â€”the sliding, flexible support surfaceâ€”envelops you as you work. As you recline in your chair it slides toward you to provide continuous flexible support for your forearms and wrists on the soft, resilient surface. Because Envelop moves and encourages movement, it lets you take full advantage of an ergonomic task chair with a synchronous tilt. It provides ergonomic support through a wide range of seated and standing postures, including a comfortable recline. Envelop fits whatever space you need it to be in. Its clean, trim aesthetic works harmoniously with any design, and you can have it in a wide variety of laminates, veneers, and finishes that lets you match any decor. It's also designed to fit just about anyone's body. The pocket that envelops your body accommodates from the fifth to 98th percentile of both women and men. Why couldn't a desk do that? Designers innovate by observing how things are and mulling over what might be. That's how Envelop began. When the late Bill Stumpf and Jeff Weber were designing the Embody chair, they became acutely aware of an unsolved problem: the lack of physical harmony between us and the computers with which we spend large portions of our days. They began to consider the small universe of the chair, the worksurface, and the surrounding environment. While working on their idea that a chair could have positive effects on the seated body, they began to understand that even the best office chair can't do it all and to focus on the problem of the static surface. Which led them to rethink the concept of a work desk. Why did computer users have to move their laptops, keyboards, and monitors manually as they tried to maintain the right position and angle while sitting or standing? Bill and Jeff began to see the chair and desk as a single system that could minimize musculoskeletal stress. Their aim was to create an adjustable interface between the two to accommodate the user's preferred patterns of postures and movements. After Bill passed away, Envelop became Jeff''s project and he was responsible for most of the work that produced the final product. It represents both a great leap forward in ergonomic design and a logical continuation of Bill and Jeff's ideas about the body in work postures that had been guiding them for years. Bill and Jeff pondered the question of why peopleâ€”even when sitting in the best ergonomic office chairsâ€”still often had a tendency to hunch over like turtles when working at computers. The different postures a person assumes continuously while seated throughout the day disrupt the relationship between the face and the computer plane. So computer users hunch, crouch, lean in toward that glowing screen. And the whole body follows suit, leading to back and neck pain, eyestrain, and fatigue. 36" x 49" x 7"
For normal cleaning, wash with a soft cloth soaked in mild detergent and warm water. Rinse thoroughly and dry with a soft cloth. Do not use solvents or abrasive kitchen cleaners. Apply isopropyl alcohol to a clean, damp absorbent cloth. Start at the outside of the ink stain and work towards the center. Apply pressure but do not rub too vigorously. It is important as the cloth becomes stained, use a clean section of the dampened cloth or the stain will spread. Apply isopropyl alcohol to the cloth as needed. If ink stain persists, use acetone in place of procedure above. This procedure is not intended for normal cleaning. Herman Miller veneers meet strict testing standards for resistance to wear, light, stains, water, and pressure. To reduce the risk of damage, take some precautions: Use coasters for glasses and mugs. If a glass top is added to the veneer surface, be sure it rests on felt pads. Donâ€™t place a potted plant on a veneer surface unless itâ€™s in a water-tight container or in a drip tray.Donâ€™t let vinyl binders stay on a surface for very long. Use protective pads under equipment with â€œrubberâ€ cushioning feet. Some chemical compounds used in the feet on office equipment, such as printers and monitor stands, may leave permanent stains or marks.